ENFIELD - It wasn’t much of a contest. 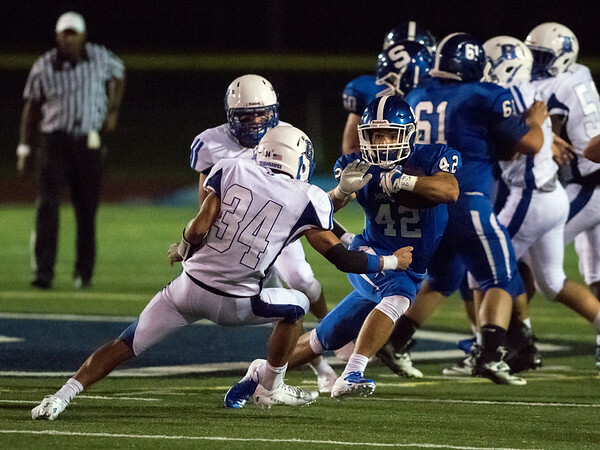 The eighth-ranked Southington football team made sure of that - by halftime - Thursday night against Enfield. The game had been pushed up a date due to bad weather forecasts. Jacob Drena threw for four touchdowns - all in the first half, all to different receivers - and Dillon Kohl ran for three more and the Blue Knight cruised to their eighth win of the season after rolling over the Eagles 51-19. At the end of the third quarter, Southington held a 44-13 lead. Drena finished with 109 yards passing and two touchdowns in the first quarter alone. He hit Jamie Lamson for a 23-yard touchdown and then connected with Carter Ulman from 11 yards out. After a 1-yard touchdown run from Kohl to give Southington a 21-7 lead with 1:30 left in the period, Drena and the offense opened up the second quarter with a 73-yard pass to Will Downes. Jacob Flynn caught the quarterback’s final scoring pass on an 8-yard completion to up the score to 35-7 with 7:25 remaining before the half. Another rushing touchdown from Kohl and a safety brought the Blue Knights’ lead to 44-7 before Enfield scored on the final play of the half. Both teams scored just one more time over the final 24 minutes with Kohl crossing the goal line with 5:45 left in the third quarter and Enfield scoring with 3:34 left in the game. Southington will now get an extra’s day rest before it gets ready to host winless South Windsor (0-7) next Friday night. Posted in New Britain Herald, Southington on Thursday, 1 November 2018 22:11. Updated: Thursday, 1 November 2018 22:14.